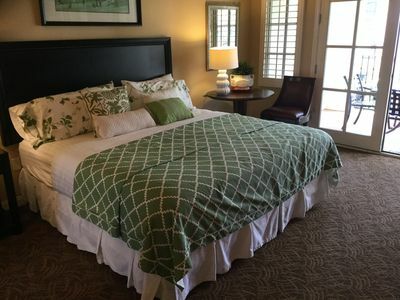 Located in the prestigious gated Lakes Country Club, our 'Retreat at The Lakes' is a 2-bedroom, 2-bath private getaway perfect for quiet relaxation. 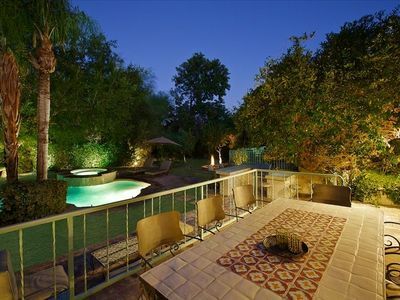 Ideal for one or two couples who wish to enjoy all the desert has to offer. See us at RetreatAtTheLakes (dot com) and say you found us on VRBO. 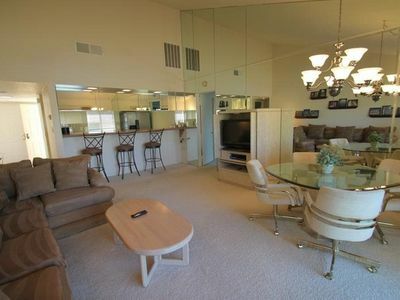 This single-level home has been expertly decorated for your comfort and convenience, including wireless internet access! Plantation shutters throughout provide solitude or open for breathtaking views. Everything exudes a contemporary desert elegance. 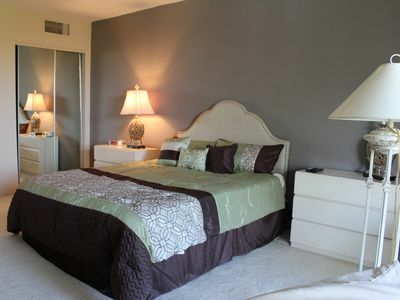 The 2 master suite sized bedrooms are comfortably appointed with all the necessities to make your stay memorable. Each spacious bedroom boasts its own cable T.V. for your viewing pleasure and adjoining double sink bathrooms for your convenience. The first suite has a king-size bed with large windows to enjoy views of the golf course. The second suite is furnished with an ample queen bed with windows opening to the sunny courtyard. 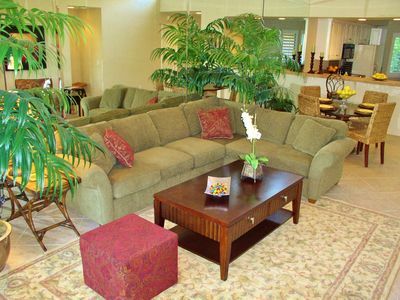 We have looked to every detail so you will find this to be your luxury home away from home. 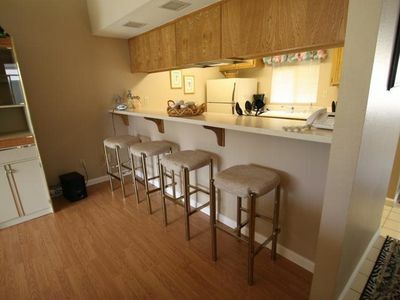 The kitchen is a well-equipped gourmet's delight with full size refrigerator/freezer, microwave, dishwasher, blender, toaster, and coffee maker and grinder. For your first morning, we offer Starbucks Coffee to enjoy at the breakfast bar or out on the inviting patio. The outdoor patio is a living space unto itself! 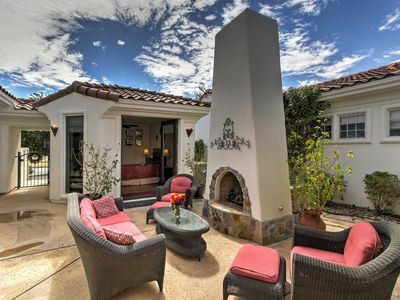 Contemporary patio furnishings include a 60' patio table and 4 chairs and 2 chaise lounges. Enjoy cool refreshments while taking in the green 8th fairway with lakes and fountains beyond. Relax with your favorite book or magazine, challenge your partner to a game of Gin Rummy or dine al fresco. Steps away is a refreshing pool and relaxing bubbly spa for your enjoyment. 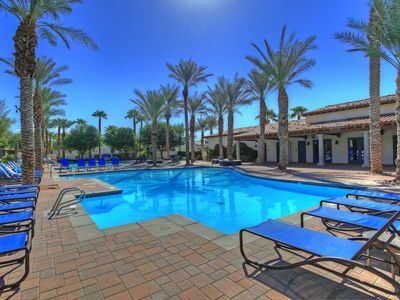 While it will be hard to leave this retreat, other amenities await you. The Lakes Country Club offers a fully staffed 45,000 square foot clubhouse featuring a grill room, elegant main dining room, lounge and pro-shop. Brush up on your tennis game at one of 15 championship tennis courts (2 are clay courts) or keep in shape at the state-of-the-art Fitness Center. Relieve the stress of the day with a massage or facial in the Spa facility. All this located within our 24-hour security guarded complex. As for golfing, there are numerous world-class courses all within just minutes of this convenient location. The hard part is deciding which one to play. 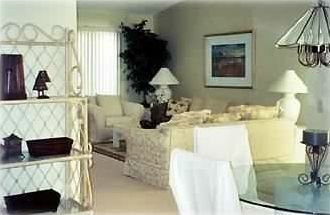 We know you will find this home a special vacation treat you'll come back to year after year! No smoking and no pets allowed, please. Until confirmed, offer subject to change without notice. 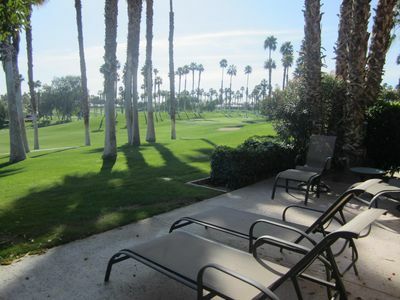 2 Bed/ 2 Bath Condo In Palm Valley Country Club On Golf course. Casa Clara - Private Hacienda on almost 1/2 acre!!! Lake Views...Close To Pool...Dual Masters! 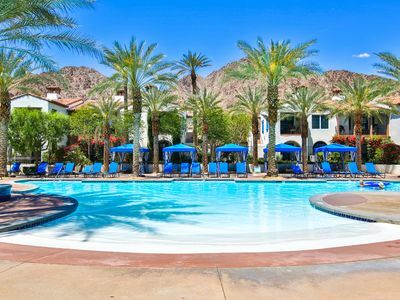 Beautiful La Quinta Desert Home w/ Casita & Pool! New Listing! Freshly redecorated, immaculate, cheery and bright.